A family of unschoolers is not allowed to leave the country to enjoy freedom of education outside Germany: In order for them not to emigrate, a local court has now withdrawn important parts of the Christian parent’s custody. Walls we have enough in this country. 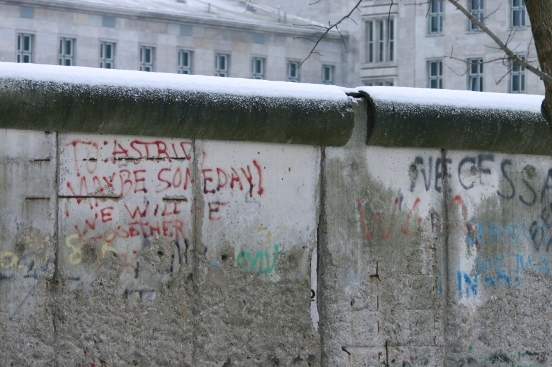 None of them symbolizes absence of liberty better than the one that used to stand in Berlin. In the final week of December 2013 family judge Markus Malkmus transferred the parent’s rights to determine residence of their children and other administrative matters to the local youth services. In effect Malkmus took the family of Dirk and Petra Wunderlich (southern Hessia) captives of Germany. They may move freely during school holidays, but apart from that it’s the state who is in control of the children. There can be no thought of moving to a more liberal country, the judge’s decision being a virtual wall around the family – not unlike another infamous structure in formerly divided Berlin. At the same time Wunderlichs have good reason to finally turn their backs on their homeland. For their deeply-rooted conviction that children’s education is better taken care of in the home than in the state’s school buildings has brought the family a lot of legal strife. Custody was partly withdran from them already on September 6, 2012. Since they still didn’t entrust their children to the state’s school they had to bear the full brunt of the total school state barely a year later: Some twenty social workers entered their home with police force, taking the four children from seven to fourteen years to a foster home. The official reason given for this seizure initiated by the youth services was the absence of the children from a state school. Although being allowed to return home after three weeks they could only do so only on condition of further school attendance. Another non-compliance would have resulted in the destruction of the family by taking away the children permanently. The question of whether removal of custody had been legal in the first place the family court wanted to settle after a time of ‘probabation’ for the parents. This has now been done. Having obeyed court’s orders in an exemplary manner, Wunderlichs could have retrieved full parental custody. One day, as thousands of other emigrating families do, they could have decided to strike camp in Germany to let their children grow up in another country – according to their convictions. Alas, family judge Malkmus feared that the freedom lovers might once again ‘abuse parental custody’ – abroad. Accordingly, he claimed that a possible migration of the family to legal freedom of education was ‘jeopardizing child’s welfare’, ignoring the legal argument that a resolution based on mere speculation shouldn’t lever out the right of freedom of movement. I cannot believe the ignorance of my native country!! I am ASHAMED at this. I know homeschooling is illegal, and honestly, if I lived in Germany I’d pbly send my kids to school there as I went to school there, too. BUT to not return the kids to their parents and keeping them from leaving the country????? I also know, that the thought of hs is very foreign there as it was to my remaining friends and family over there, but they have seen and experienced my kids and are quite happy with what they’ve seen so far. I soo wish I could write a letter to that judge to help him see. On the other hand, they may seize my children next time we go to Germany 🙁 So frustrating and sad.